Verify offers both a fully hosted cloud solution or options for on-premise installation. The Versify Platform provides for over 80+ standard integration types as well as experiences with a myriad of client specific internal system integration. The Versify application suite provides the flexibility to implement your solution on our Cloud environment or on your companies on-site infrastructure. The Versify Cloud provides a quick implementation, lower cost-of-ownership and a complete solution in a secure environment. 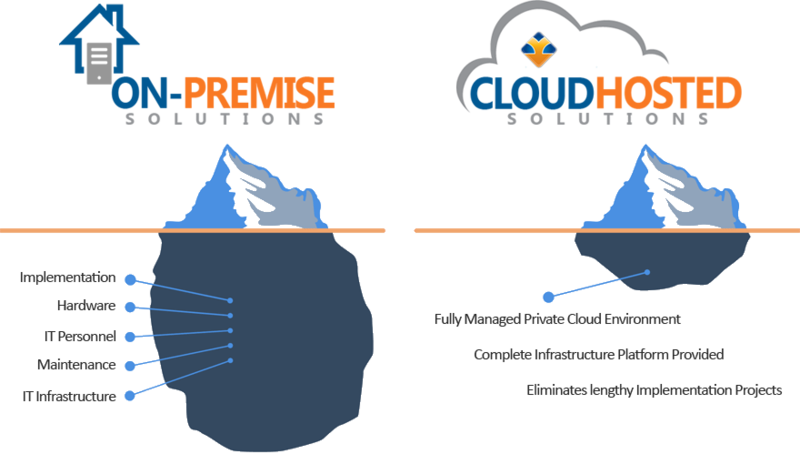 Our On-Premise services allow for complete support for on-site installation and upgrades. Rapid Deployment platforms are provided on the Versify Cloud. Versify provides a complete cloud hosted solution for all of it’s applications. Fully managed services are provided for quick implementations and configuration, a secure and economical infrastructure platform and a robust library of interfaces and integration capabilities. Now you can leverage and manage all your data through a single application with only a browser. Enabling your employees to work from anywhere, anytime. Versify provide on on-premise services allowing for support for on-site installation and upgrades. Equipment minimum requirements and configurations are provided and virtualization is supported. Training is provided for employees so they can install and configure the platform and implement updates. The Versify technical staff are available by phone and web conferencing during all implementations and upgrades as needed to support change management.